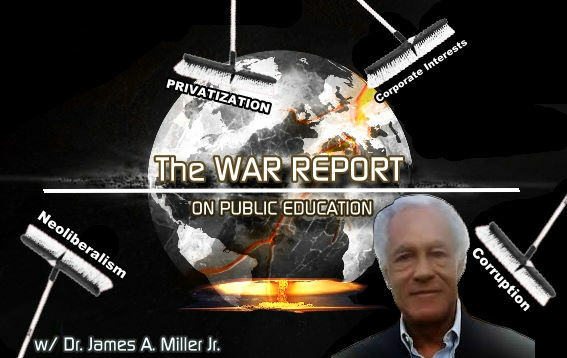 The format of THE WAR REPORT ON PUBLIC EDUCATION explores one of the most important events in our life time - the total takeover of our educational system by corporate interests. This show is about the 'corporate' war on public education and the rising public resistance movement to the war. Dr. James Avington Miller, Jr. invites guests from all over who join the rising public resistance movement against the corporate greed taking on our public school system. He is interested in growing a grass-roots movement here in the United States and in Europe against the 'corporate interests' that are limiting both teachers and students everywhere. This October 2015 he is taking his show on the road as he embarks on a very special project. His long awaited project ‘The People’s Story' is an effort to reach out to those individuals whose voices are not being heard in educational arenas everywhere. He will be interviewing, filming and collecting stories from parents, teachers, students and community members in the rural and urban areas of the Eastern United States to include Maine, Connecticut, Massachusetts, New York, New Jersey, Maryland and Washington D.C. Many lives are being impacted and harmed by the ongoing corporate war on public education that exists today. The consequence of the rapid privatization of our schools is inhumane and devastating to our teachers, schools and most importantly, our children. His primary mission is to create a documentary/television series for PBS and the Arts & Entertainment Channel that will expose the human cost of man’s inhumanity to man. The objective is to document people’s stories from each state and create a one hour TV Episode for that state evolving into a 30-35 part series. Dr. Miller expects to have the first TV show ready by next summer. This will propel the ‘corporate war on public education’ front and center as a local, state and national campaign issue. Determined to awaken the world on a national level by providing a series of programs that will lead to understanding the whole picture – he hopes to demand an end to the Corporate Elite and their destruction of public education. Dr. Miller is seeking funding for ‘The People’s Story’ project from friends, family and the public to cover the expenses that this will entail. The quickest way to support this project is by giving online using your credit card or debit card to https://www.gofundme.com/thewarreport. If you care about the future of education, please support this most important project and be part of history in the making. This has been and will continue to be Dr. Miller's dream to complete and certainly his life's legacy. The War Report on Public Education, March 11, 2018 Last show - Call to War -Teachers Becoming Leaders - We Need to Win the War! The War Report on Public Education, February 11, 2018 Black History Month 2018, Part 2 - The Importance of Black American Women. The War Report on Public Education, February 4, 2018 Black History Month 2018 Part 1 - The Fight for Black Education. The War Report on Public Education, January 28, 2018 What are Positive Youth Development (PYD) Schools? The War Report on Public Education, January 21, 2018 what are our choices for the purpose of public education and our schools? The War Report on Public Education, January 14, 2018 What If We All Had a Shared Vision for Public Education K-PhD? The War Report on Public Education, November 19, 2017 Can Education & Educators Change Society - or not? The War Report on Public Education, November 12, 2017 Who is "at-risk" in our schools? The War Report on Public Education, September 17, 2017 with Dr James Avington Miller Jr. The War Report on Public Education, September 10, 2017 with Dr James Avington Miller Jr. The War Report on Public Education, August 20, 2017 Happy Birthday Dr. Miller! Facebook Twitter LinkedIn The War Report on Pub Ed - A Public Group Page - Join us! Public Advocate, Activist, Professor, Independent Scholar, Radio Talk Show Host and documentary filmmaker. 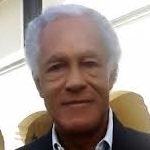 James A. Miller, Jr., PhD is a public education advocate, activist, professor, independent scholar and documentary filmmaker. For most of his life, he has been involved in and with public education, either as a student, university professor, researcher, substitute teacher and full-time classroom teacher K-12. Dr. Miller has held Professorships in Sociology/African-American Studies at Wayne State University, the University of Detroit, California State University at Northridge and Los Angeles, and the University of California in Los Angeles (UCLA), and has been a Senior Research Associate at the National Institute of Education (NIE) in Washington, DC – focusing on creating a five year national research program on the social and cultural foundation of education. His email address: jamfilm@yahoo.com, and he cordially invites people to write him and express their thoughts. I am loving your show so much that I'm catching up on episodes that I've missed. This one is so informative! I never knew the Sputnik link to our "failing schools" and the theme of the education system being set up to respond to perceived crises is a very useful concept. Thanks so much for these shows and for our work! Thank you Dr. Miller for covering such a controvercial subject - and you present it with such clarity and depth - looking forward to the unfolding of what you have researched! WOW, what a fantastic show! I am so looking forward to learning more, as this is a very serious and troubling scenario, what is happening to education world-wide. Thank you for your desire to educate us on this matter! I'll be listening! I want to thank you Dr. Miller for your show on BBS radio. As an avid listener to the various shows on BBS radio I was pleased to hear a show that will tackle such a complex issue.